Since ancient times, crystals have captivated humankind. However, the beauty of crystals is not only found on the outside but also on the inner structure. The arrangement of atoms or the stacking of molecules display also perfection and harmony that are constantly surprising us. Crystal structures, solved by X-ray diffraction, have allowed scientists to explain different properties of many different substances: minerals, new materials, medicaments, and biomolecules. Beyond the scientific utility of crystal structures, they are also cause of awe and amazement. The purpose of this contest is to unveil the hidden beauty inside crystals, by looking at their inner structure with artistic images: art inside your crystals. The period for sending images starts September 30th, 2014 and ends November 10th, 2014. 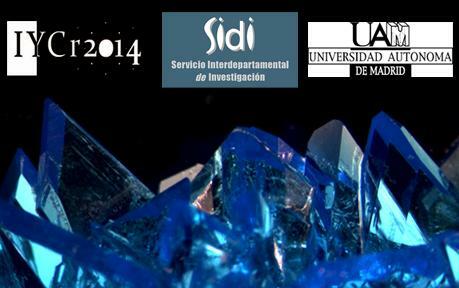 The Jury’s decision will be announced online November 25th, 2014 at the SIdI web page http://www.uam.es/sidi. A prize awarding ceremony will be held during the second week of December 2014; the exact date will be announced in advance. Entries must comply with the rules specified in Rules_English.pdf. A total maximum of 3 entries are allowed per participant, and may be included in the two different categories AUTHOR or GENERAL. Each participant must supply the data required in the available entry form, Formulario.doc. There is an available example file (Ejemplo.pdf). Images must be sent in .JPEG, .BMP or .TIF formats. The minimum size of the images should be 2480 x 3508 pixels (equivalent to A4-size paper with a 300dpi resolution) and must not exceed 25MB. The image, along with all the other required documents (entry form, structural data file and, optionally, the paper in electronic format in which the solved structure is included) must be sent to the e-mail address cristal.sidi@uam.es using the “Sistema de Envío de Grandes Archivos” (https://ficheros.uam.es/) provided by the Universidad Autónoma de Madrid. Contestants not belonging to the UAM must use the “Acceso Anónimo”. Detailed instructions are available in the document Rules_English.pdf.